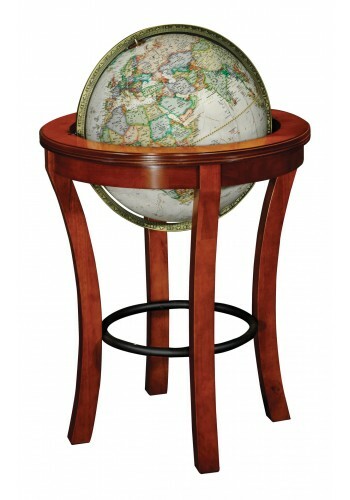 Replogle's dignified National Geographic Garrison Floor Globe has a classic design that complements any setting. The hardwood stand includes four sabre legs and a decorative wrought iron ring. Constructed of high-quality paper fiber, the globe ball features raised relief, vivid map colors and off-white oceans. The diecast full meridian is plated in beautiful aged brass. Backed by a one-year warranty.